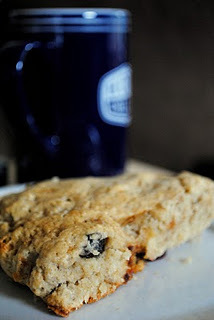 gluten-free buttermilk scones | gluten-free glory! I’m still on my dairy kick – it’s fun playing around with a whole “new” food group! Today was my last day of vacation, so I celebrated appropriately by baking scones. These are pretty tasty – a bit dry, so you might only use 2 cups of flour, but otherwise, yum yum yum! Enjoy…. In a bowl whisk together 1/2 cup of the buttermilk, the eggs, the vinegar, the brown sugar, and the vanilla until the mixture is combined well. In another bowl stir together the flour, the baking powder, the baking soda, and the salt and blend in the butter until the mixture resembles coarse meal. Stir in the granola and the buttermilk mixture with a fork until the mixture just forms a sticky but manageable dough. Knead the dough gently for 30 seconds on a lightly floured surface, pat it into a 3/4-inch-thick round, and cut it into 8 wedges. On an ungreased baking sheet brush the wedges with the remaining 1/4 cup buttermilk and sprinkle them with the sugar. Bake the scones in the middle of a preheated 400°F. oven for 15 to 18 minutes, or until they are golden. *I used a blend comprised of three parts brown rice flour, one part tapioca flour, and one part sorghum flour.